I was a member of the creative team (artistic directorate) responsible for developing program for the Adelaide Festival 2002. Peter Sellars was the Artistic Director for the Festival. Associate Directors were: Angharad Wynne-Jones, Jonathan Parsons, Amanda McDonald Crowley, Lynette Wallworth, Waiata Telfer, Catherine Woolcock, Karl Telfer, Gay Bilson, Bridget Ikin. The Festival was collaboratively programmed around the themes of Environmental Sustainability, the Right to Cultural Diversity, and Truth & Reconciliation. In truth while the Festival was wonderful and exhilarating, the journey was not an easy one. Peter Sellars was obliged to resign from the position of artistic director only four months before the Festival opened, and the decision of the associate directors to continue to realise the program was not straight forward. Already in an interview in the local newspaper, the Adelaide Advertiser in May 2001, Peter was quoted as saying “One of the things I’m sticking by is that this will be a festival of seeds and not trees . . . you will see the trees in 2010.” There were, in fact a number of outstanding programs. And there are a number of key legacies that the Festival arguably influenced, including: the establishment of a significant Film Festival in Adelaide; Indigenous welcomes are now standard at cultural events in Adelaide; the central square in Adelaide now has dual naming… Many of these things may have happened with time. I feel certain, however, that we also sowed some seeds for change. Information is available for conVerge: where art and science meet, a program I co-curated for the Festival. I also have documentation of renaming project, Tarndanyungga, undertaken by a group of artists on the last night of the Festival. 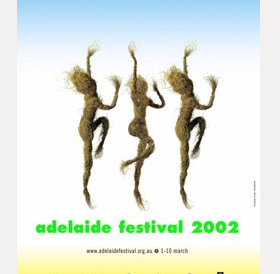 Little remains of the online presence for the Adelaide Festival 2002. I’m in the process of locating additional relevant program materials to add to this post. 2002 Adelaide Biennial of Australian Art – conVerge: where art and science meet, an exhibition which profiled a selection of work from Australian artists working with these themes in an exhibition at the Art Gallery of South Australia. conVerge symposium: an opportunity to share ideas (at the Adelaide Festival 2002 and online) where opinions were expressedon: Image and Meaning, Knowledge Systems, Ecology, Genomics, Bioeconomics and Partnerships. conVerge archive: a space for documenting projects, stimulating discussion and archiving conversations, email dialogues, hypotheticals, unrealisable projects, online discussions and forums. Exhibiting artists: Oron Catts and Ionat Zurr, Justine Cooper, Rebecca Cummins, Adam Donovan, Fiona Hall, Jason Hampton, Nigel Helyer, Joyce Hinterding, Jon McCormack, Mangkaja artists, Patricia Piccinini, Lynne Sanderson, Mari Velonaki, Martin Walch. conVerge curatorial working group comprised: Linda Cooper and Amanda McDonald Crowley, co-chairs. Jenny Fraser, Victoria Lynn, Karl Telfer, Sarah Thomas, Lynette Wallworth, Angharad Wynne-Jones.